Who is Michigan Targeting at Wide Receiver in 2016? After Devin Funchess declared for the NFL draft earlier this year, Michigan is left without a true play-maker/red-zone threat at the Wide Receiver position. With unproven receivers such as; Jehu Chesson, Freddy Canteen, Drake Harris, Maurice Ways, Jaron Dukes, and Brian Cole listed on the depth chart for 2015, the number one receiver position is up for the taking. While Michigan will need one of these current roster players to step-up this year, the coaching staff has made Wide Receiver a position of need for 2016 and is already looking for the next great Wolverine wide-out. According to 24/7, Michigan has offered 19 Wide Receivers so far in the 2016 recruiting cycle, and while some have already committed to other programs, the Wolverines stand in good position with multiple recruits. So, who is most likely out of this group to join the Wolverines? Desmond is a prospect that was offered by the previous coaching staff as well as Jim Harbaugh’s staff. Although he committed to Louisville in October, I believe Desmond is a prime candidate for Harbaugh to flip. After watching Desmond’s film, I’m really impressed as to what he brings to the football field. He has good size standing at 6’2 and weighing 190 pounds. Although he will have to add on some muscle mass, he doesn't get pushed around the field. He’s got a solid burst off the line of scrimmage and good straight line speed. Possesses good field vision and will wait for his blocks to be set on short yardage throws. Will constantly challenge the secondary in over the top throws and can high point the ball. Has very good hands and is constantly catching balls that are hard to bring in. Although he’s not the most elusive receiver I've watched, he isn't easily brought down by defenders. Route running seems to be his weakness as he runs routes a little sloppy, but as most things go, this can be corrected during his senior year and with lots of reps.
Desmond has visited Michigan twice in the past month and seemed to really enjoy his time on campus, taking in a Michigan basketball game and watching the team’s first spring practice on separate visits. He is currently ranked as the #55 wide receiver in 2016 according to Rivals. Like Fitzpatrick, Dylan is a recruit that has been pursued by the previous coaching regime and the current staff. In my opinion, Dylan is hands down the best receiver in the state of California for 2016. Next year, he will team up with current Michigan QB target K.J Costello and form one of the most dangerous WR-QB tandems in the nation. There has been talks of Costello and Crawford being a package deal, and if Michigan is lucky enough to land Costello, I would imagine Crawford wouldn't be too far behind in committing to Michigan. Dylan is as elusive of a receiver that I've watched on film for 2016. He’s extremely dangerous when the ball is in his hands and has the ability to take a small yardage catch into a big gain. He’s very agile and can beat his man in either zone or man-to-man coverage. Above average speed and when in open space turns on the burners to outrun defensive backs. Dylan is a very smooth route runner and with sudden stutter steps or jukes can get open with relative ease. Has soft hands and rarely drops a catch-able ball. Standing at 6’1 and weighing around 170 pounds, Dylan could see playing time either as a slot back or in the traditional wide receiver sideline spot. One aspect of his game that goes unnoticed is his ability to block. His highlight reel features many plays with Dylan cutting across the field to set up blocks for his running back or other receivers. Dylan is hands down one of the top 10 receivers in 2016, and with K.J Costello joining him next year, I fully expect him to have a big season. Recently, Dylan spoke with Rival’s Adam Gorney about how he hoped Oregon would offer him a scholarship. If this offer comes to fruition, Oregon may be the front runners to land the talented receiver. Dylan is ranked as the #13 wide receiver and the #69th overall prospect in 2016 according to Rivals. He holds offers from schools such as; Arizona State, USC, UCLA, Stanford, Oregon State, Miami, LSU, and Notre Dame. A reoccurring theme to this list is recruits that have been recruited by both coaching staffs, and that continues with Theo Howard. Theo’s recruitment has exploded over the past few months. When the previous coaching staff offered Theo, Michigan was only his third offer. Today he holds over 20 offers from mostly “power five” conferences. Howard is a very under-rated receiver in my mind. After watching his highlight film, it’s very easy to see that Theo possesses great hands and does an excellent job of catching the ball with both hands. He’s not necessarily the fastest runner I've ever seen but, he does have more than adequate speed for the college level. He does an excellent job of keeping his legs moving while trying to be tackled, which results in extra yardage. Very shifty runner and has excellent lateral movement. Can beat defenses over the top or on short yardage throws. Constantly runs good routes and gains space. I think Theo could be an excellent slot receiver at the next level, just not a #1 receiver unless he bulks up quite a bit. 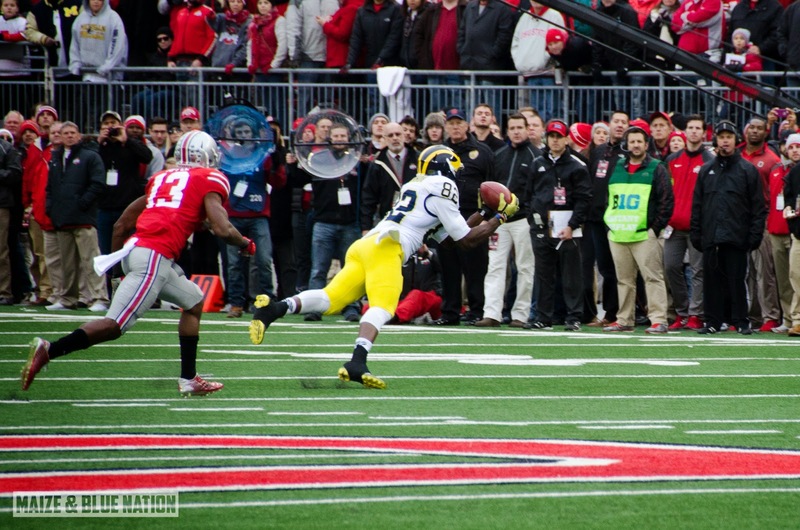 Theo could also see playing time early on in his collegiate career as a punt/kick returner. Theo is currently ranked as the #19 wide receiver and #106 overall according to Rivals. He has offers from all over the country including; Arizona, USC, UCLA, Texas A&M, TCU, Oregon, Notre Dame, Nebraska, and Boston College. Theo also plans to visit Michigan in April according to 24/7’s Steve Lorenz. Donnie is a recruit that has had a massive rise in his recruitment. Last September, Corley was ranked among the top 300 recruits on both 24/7 and Rivals yet, didn’t have a star studded offer sheet. After hitting multiple camps and having a stellar junior season, Corley has seen a big jump in his rankings. Donnie possesses a great burst of speed off the line of scrimmage, and can out run almost any defensive back. He does an excellent job of catching the ball over the middle or on the sidelines. Out of all the in-state prospects, I think Corley might have the best hands out of all the Wide Receivers. He has ideal size at 6-2 and already weighing 185 pounds as a high school junior. He does an excellent job of catching the ball with two hands and cradling the ball into his body. After watching his highlight film, you don't see Corley catching many jump balls due to the fact that when he normally gets catches, there in open space. He's a more than adequate route runner, and paired with his excellent speed, Donnie has all the tools to be a dangerous weapon at the college level. Not only is he dangerous as a receiver, he does an excellent job at fielding punts and kicks for his King high school team. With him having still one more year of High School ball left, Donnie has all the time in the world to fine tune his game and become one of the best receivers in the nation. Donnie is currently ranked as 12th best receiver in 2016, and #66 overall according to Rivals. He has an impressive scholarship offer sheet including schools such as; Alabama, LSU, Michigan State, Ohio State, Oklahoma, Notre Dame, Arizona State, and Mississippi State. As a junior, Corley had 1,087 receiving yards with 18 touchdowns. Eli is the first name on this list that wasn't recruited by the Brady Hoke coaching staff. With the previous coaching staff, recruiting SEC territory proved to be a difficult task. With Harbaugh now at the helm, he’s placed a national approach to recruiting and it’s easy to see that recruits are taking notice. Eli is a dominant force for his Niceville High School squad. He’s extremely quick and can hit top speed in a few steps. An above average route runner, who can be dangerous in open space. Has some of the best field vision I’ve seen on tape and can make almost any defender miss. When the ball is in Eli’s hand, he runs almost like a running back. Can make defenders miss with a good side step move and can change direction on a dime. Excellent body control and can contort his frame to catch the ball. Can run almost any route and attacks the ball very well. Can turn on the burners and outrun basically anyone on the field. Very dangerous deep threat. Has the ability to line up in the slot or on the outside. Would like to see him play a little more physical on the line of scrimmage, as he generally uses his speed to get past defenders. 24/7’s Steve Lorenz caught up with Eli last month to talk about his recruitment, with Eli telling him that Michigan and Auburn are the two schools recruiting him hardest at this point, and that he is in the works of planning a trip to Ann Arbor in March. Clearly this is a good sign for the coaching staff as only a few months ago, Eli was nowhere near being on Michigan’s radar. Eli is currently ranked as the #4 wide receiver and #29 overall in the 2016 recruiting cycle according to Rivals. He holds scholarship offers from almost every big named school such as; Auburn, Florida, Florida State, LSU, Miami, Notre Dame, Ohio State, and Georgia. At this point in his recruitment Auburn looks to be the leader for his services. 2016 DE target Terrell Hall committed to Ohio State on Monday night. Hall was offered by the Michigan in early February. On Sunday 2016 LB target Rahshaun Smith became the first Linebacker to be invited to the Nike's "The Opening." 2016 RB target Matt Falcon picked up offers from Louisville, Nebraska, West Virginia and UCLA over the past two weeks. 2016 LB target Caleb Kelly released his Top 10 schools on Monday with Michigan making the cut. 2016 DB target Marquel Dismuke committed to Cal last week. Michigan offered him on February 4th.